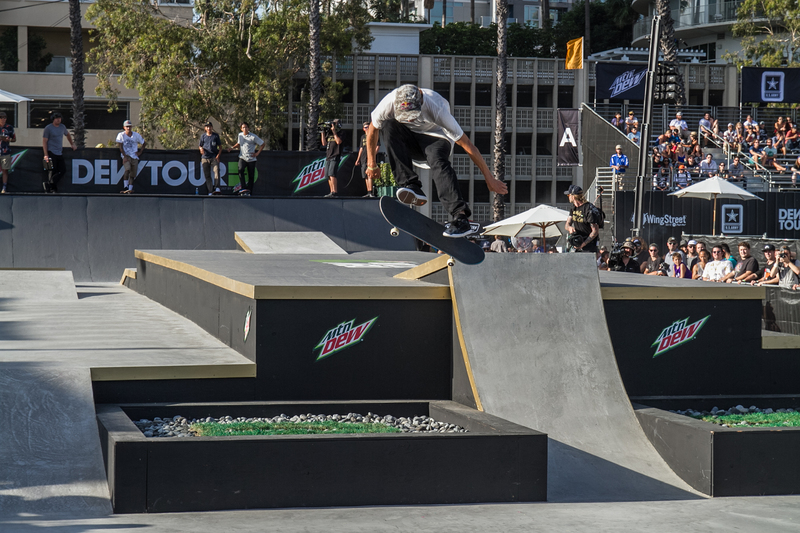 The highlight of Dew Tour 2016 Day 2 was the individual pro contest. 18 of the best skaters in the world were hand-picked to compete on the four separate courses: Tech, Bowl, Rail, and the top six advanced to the Gap section. Three heats, six-minutes each. Six skaters per heat. That's one minute of contest time to make your best tricks. That's a lot of pressure, but nonetheless the guys came through. Alec Majerus made both his backside Smith backside 180 and backside Smith frontside 180 on the out-rail, as well as a backside 180 fakie 5-0 on the out-ledge. Three bangers in under a minute is a pretty good ROI. In fact, the out-rail was probably the most popular obstacle of the tech section, with a boardslide-hurricane from Caswell Berry, a backside overcrook from Cyril Jackson, and many more. Curren Caples opted to take over the long flat bar with a half-Cab feeble, backside 180 out. Sean Malto breezed through a frontside crook to fakie across the long ledge gap, and Chris Joslin ended his heat with a bigspin front board on—you guessed it: the out-rail. The bowl section is where you saw a clear disparity – some guys you can tell grew up with a bowl at their local park (looking at you, Curren Caples) and others were attacking it like a mini ramp, with all the tech tricks they could pull in the ten-minute heat. Cody McEntire strung together a series of flip-ins or flip-outs nearly every time, but it was Curren Caples, Louie Lopez, and Vincent Alvarez who stood out as naturals. Vincent, it should be noted, was the only one attacking the bowl switch—his high-speed switch backside carves may well have been the gnarliest thing to go down in the bowl. It was refreshing to see street skaters put down some vert moves, as well as bringing their street skills to the bowl. Sheckler was throwing out gigantic alley-oop airs over the hip. Sean Malto was crailsliding the six-foot section, but also throwing no-complys over the hip. David Loy held on to one of the craziest maneuvers of the day—at the end of his heat, he threw a Hail Mary: a frontside 50-50 drop down to 50-50 on the lower section, and hung on. Some guys opt for only landing the best tricks. Carlos Ribeiro, for example, made only two tricks in the rail section – but they were two of the best tricks done. He nailed a switch back lipslide down the six-stair rail, and a backside overcrook down the nine-stair. Other guys take the quantity-over-quality approach. Ryan Decenzo is probably the best example. During the six-minute heat, he managed to land four separate tricks that were each worthy of a video part. And then there's Chris Joslin. Joslin managed to backside Smith grind the nine-stair, and bigspin board the six—both ways. That means frontside and backside. Heat two is where the rail section really came alive, though. At least 18 banging tricks went down in the span of six minutes. That's three tricks every minute. You'll never find that much insane skating in so short a window. Consistency was key, but don't think that the tricks were watered down. Tiago Lemos, star of last night's documentary Guerreiro, opened the heat by switch back tailing the nine-stair rail—first try. Lemos then proceeded to make four other bangers throughout the heat, including the only grind up a rail in the entire contest. Ryan Sheckler was the one to close out heat three, with a solid Cab backside lipslide on the A-frame rail, and a backside lipslide to fakie, all the way across and down the long flat bar. Good note to end on. In the end, only six were selected to compete in the final course: the gaps. 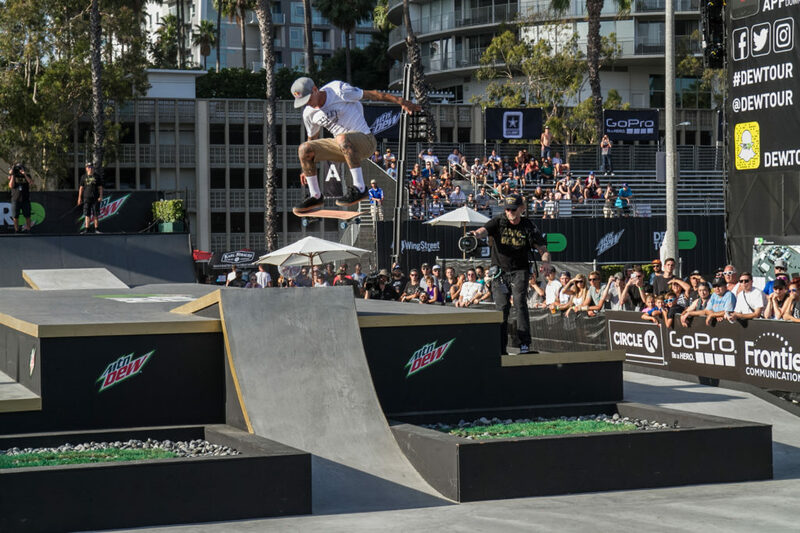 Ryan Sheckler, Louie Lopez, Sean Malto, Ryan Decenzo, Carlos Ribeiro, and Cody McEntire were given a total of six minutes to huck themselves across and down a variety of gaps. 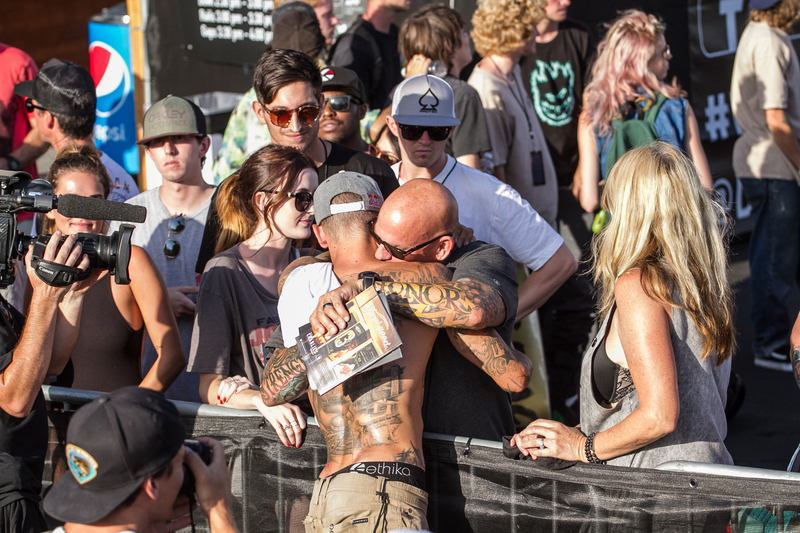 Despite some heavy competition from his friends, Sheckler came out on top, sealing the deal with a backside flip on the bump to gap, among other bangers. Louie Lopez claimed second place, and Ryan Decenzo took home third. I don't think we've ever seen such a hot list of skaters on such a variety of terrain. But from the looks of things, everyone in attendance had an unforgettable time. How will the teams fare tomorrow? You'll have to tune in to find out.